Insuring Segways, Electric wheelchairs & Mobility vehices. 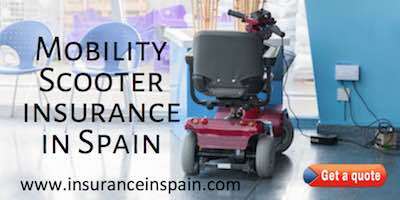 Many questions have been asked regarding insurance for Mobility Scooters, Segways and Electric Wheelchair use in Spain.These vehicles can be insured and must have a registration number to be insured. Some policies do allow coverage on their house insurance policies and the cover can be restricted. best to give us a call aso that we can assess your needs and find the correct insurance for you. The main purpose of any mobility scooter is to provide a means of transport for those not able to do so, due to illness or some form of disability. This form of transport provides them with an affordable means of getting around and having the freedom of movement and choice so that they can complete basic tasks such as getting about, doing the shopping etc. independently and not having to rely on others. So what are the different categories of mobility scooters? These are generally the smaller mobility vehicles and wheelchairs that can be folded up and put in the back of a car, that do not exceed 4mph. They are allowed to travel on pavements, cross over roads and are suitable for indoor use. Larger mobility vehicles that can travel up to 8mph and can be used on roads and pavements. You do not need a driving license to use one. Until the new national law is in place in Spain and according to the Direccion General de Trafico (DGT), these vehicles cannot be used on pavements. Many councils believe that the use of these vehicles by elderly disabled people, on public roads will cause more problems than them being permitted to use them on pavements, pathways and cycle routes. In some towns and cities in Spain there is a distinct lack of cycle routes and pavements for them to use. However, the use of electric powered vehicles can be regulated differently under local council laws, which means that every individual council or municipality in Spain can create their own rules until the new rules come into force. In areas like Benidorm on the Costa Blanca, it is estimated that as many as 500 mobility scooters are rented out on a daily basis and has become one of the busiest places in Spain to utilise the use of mobility scooters and electric wheelchairs as a basic means of transport and not just for those that are disabled. Large numbers of electric disability scooters can be seen all over the pavements and outside popular bars and restaurants. Used at high speed and under the influence of alcohol they have been causing a nuisance to other road users and pedestrians. New regulations are in force regarding the use of mobility scooters in Benidorm to stop the use of them by individuals that are not disabled or elderly. The rental of such mobility scooters will be restricted to those that have an accredited, permanent or temporary disability of any age, or who are over the age of 55 years of age without a disability. No, it is not a legal requirement to have insurance on a disability scooter. However, with the rising number of personal claims for injury from those that have ben hit and injured by these vehicles and for accidents that are caused by them, we highly recommend that insurance be obtained. If you have an accident and it transpires that it was your fault, you will have to pay compensation, repair bills and any medical expenses that may occur to you and/or a third party. In Benidorm, the law has now been changed and it requires all hire companies to provide third party liability insurance to cover any damage caused to other vehicles, property and to public roads. Third party liability insurance does not cover for theft or damage to the vehicle you are using and may not cover damage to other persons or cover medical expenses. Do they need to be registered? Apparently not. It is not a legal requirement at this time to register any disability scooter. We do believe that this is being considered due to the high number of them in Spain being used in holiday resorts as a cheap means of transport. With the ever increasing number of disability scooter thefts, incidents and accidents taking place with uninsured scooters, it is only a question of time before the local authorities request some kind of registration process. Local towns like Benidorm on the Costa Blanca have instigated requirements that all Mobility scooters carry a registration identification badge so that the rental hire firm can be identified in the event of an incident. As a result of them not being classifies as motor vehicles no form of road tax is payable. All normal parking restrictions apply to mobility scooters and electric or powered wheelchairs. You are not permitted to carry any passengers on or in a mobility scooter. Any mobility scooter that is designed to carry two people cannot be used on the road or pavement as they do not meet the official terms of an invalid carriage in law. The law does not clarify if children/babies carried in a pouch is lawful. Make the assumption that this is not allowed and stay on the right side of the law. Do Disability Scooter Hire Companies Offer Insurance? 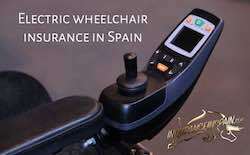 There are many horror stories of disability scooter hire companies in Spain not providing any form of insurance with their vehicles when you hire them. Any damages, loss, theft or third party incidents have been passed on to the driver of the vehicle and some have had to spend a fortune on repair bills, replacement costs, third party liability and medical claims when they have been involved in an incident. More and more reputable disability scooter hire companies are now providing some of the basic third party liability cover and some offer fully comprehensive insurance as a package. Obviously the hire premiums will be higher, but you are better off being protected at all times. Some of these machines are expensive to replace if stolen. Always check, read and get a copy of the insurance documents and keep them with you at all times. Some Spanish Hotel chains have banned the use of mobility scooters in their hotels due to the inconvenience they are causing customers. Wheelchairs have been permitted but only in the cases whereby residents can provide proof of an accredited disability. Hefty fines, up to 500.00€ have been issued to users going the wrong way down one way streets in Spain in areas where the pavement was not wide enough for the vehicle.